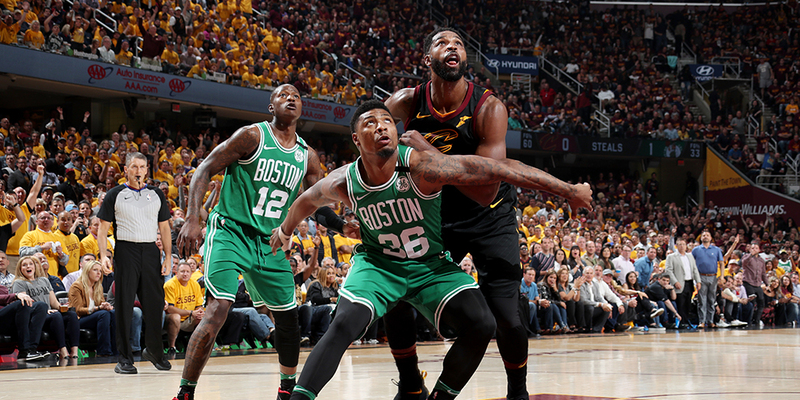 The Cavs have gotten back into the series with the Celtics by going big. Why has that change been so effective? Every spring seems to bring further evidence of the fading impact of the non-shooting big man. As Chris Herring recently detailed at FiveThirtyEight, five years ago the Atlanta Hawks played Roy Hibbert off the floor and out of the league by putting shooters at center, and those around the league began wondering aloud about the value of big men who couldn’t spread the floor. Each subsequent season that talk has only increased in volume. As the stakes rise and the tactical battles unfold, coaches have increasingly gone small and opposing coaches have felt they’ve had no choice but to follow suit. If you had followed the Cavs in the first two rounds, you saw further evidence of this trend: Cleveland mostly started Kevin Love at center and only played Tristan Thompson and Larry Nance Jr. a combined 25 minutes per game. But Cleveland’s series against the Celtics provides a counterpoint to this trend, because the Cavs have climbed back to knot it at two games apiece not by downsizing, but by upsizing.